New items are entered at the bottom. Updates are inserted with the original item. Littoral Combat Ships (LCS) . The definition of littoral is "region along a shore". Now that threats against the deep water navy are reduced , the new "buzz" is for naval capability in shallower coastal regions. Background . The new design ship in 2004 was of 1,000 tons [it doubled, then tripled], about the size of a WWI-era destroyer or gunboat, perhaps more reminiscent of LSM(R) equipped for shore attack with guns, mortars and rockets. Early expectations were that the new ship is likely to be a catamaran to operate as a floating truck, relatively small and able to run at high speeds in shallow water. It would carry one or more "mission modules" designed for jobs ranging from mine-clearing to cargo-hauling. The modules are to be quickly interchangeable, so that an anti-mine module can be lifted off the deck and replaced in a few days with one equipped with anti-submarine weapons or provisions that could be ferried to Marines operating ashore. The Navy expects to run each ship with a core crew of perhaps 20 sailors. Specialists would come aboard with each module. Competing for the ship production are General Dynamics, which is offering a three-hulled trimaran based on an Australian design ; Lockheed Martin, which is proposing a more conventional monohull design ; and Raytheon, which is suggesting a "surface effects ship" that rides on a cushion of air, like the Landing Craft Air Cushion. The Navy hopes to choose from among the three designs in May'04. The five-year shipbuilding plan calls for 13 ships with a goal to buy 56. 15Dec'04. 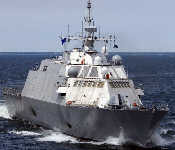 Lockheed Martin awarded contract for detail design and construction of the first Flight 0 LCS with target launch 2006. 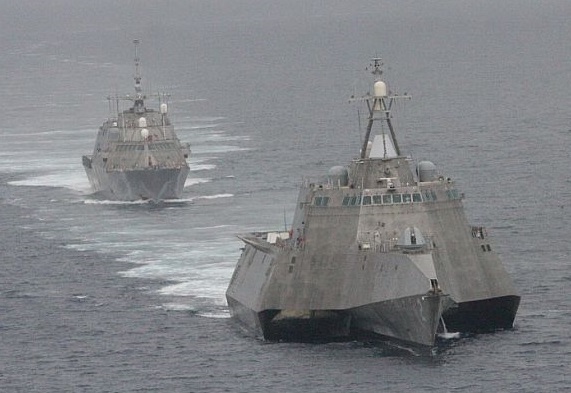 The Navy plans to build a total of four Flight 0 LCS. This is the conventional hull version. We are led to think of the original design as a super PT-boat, but the ship built is the weight and length of -- and is easy to think of as -- a late WW2-era destroyer. Compare the advancement in 64 years. 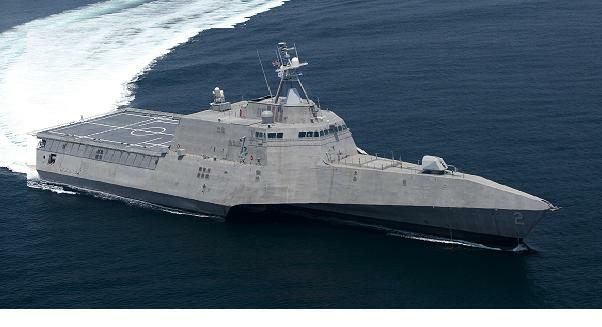 Freedom (LCS-1), 2008 : 3,239 tons; 378 ft, 57' beam, 13' draft; 40+ knots. Also contrast with Sea Fighter FSF-1 and with Stiletto on next generation page. 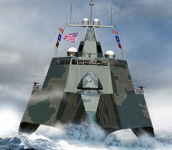 Freedom (LCS-1) design by Lockheed Martin. Specifications : Displacement: 2135 tons (light), 2862 tons (full) ; As delivered, overweight, 3,089 tons, full 3,139, Length: 378' (oa), 324' (wl) ; Beam: 57' (extreme), 43' (wl) ; Draft: 13' (navigational draft), 14' draft limit ; Propulsion: Two gas turbine engines, two propulsion diesels, two (4?) waterjets ; Hull: steel ; Superstructure: aluminum ; Speed: max 59 kts. ; [ builder's trials only say greater than 40 kt.] Range: 1500 nm at 50 knots, 4300 nm at 20 knots . Complement: 26 + mission crew . Armament: 57mm gun, hellfire missiles and machine guns. 02June'05. Keel laid by Marietta Marine, Marietta, WI. 09Jan'06. A contract for Mission Packages has been awarded. There will be three modules for plug-and-fight capability that will go to sea aboard LCS. Mine Warfare (MIW) module will provide remote minehunting and airborne mine neutralization. Anti-Submarine Warfare (ASW) module provides high-quality acoustic surveillance and weapons aboard unmanned surface vessels. 18Sept'08 rolled out. Surface Warfare (SUW) includes a 30mm cannon and surface to surface missiles. Cargo mission no longer mentioned. Launched 23Sept'06. To commission and arrive at homeport San Diego, early '07. Doesn't seem to have happened. 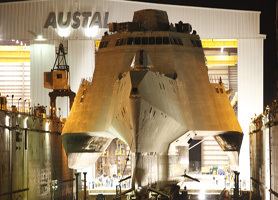 25April'07, a fire at Marietta Marine, damaged LCS-1 during outfitting of the vessel. Freedom, only 80% completed, sustained significant damage. 18Sept'08 accepted by Navy, to christen soon, then deep sea trials off Norfolk. 08Nov'08. Commissioned. Home port San Diego. 08Sept'09. 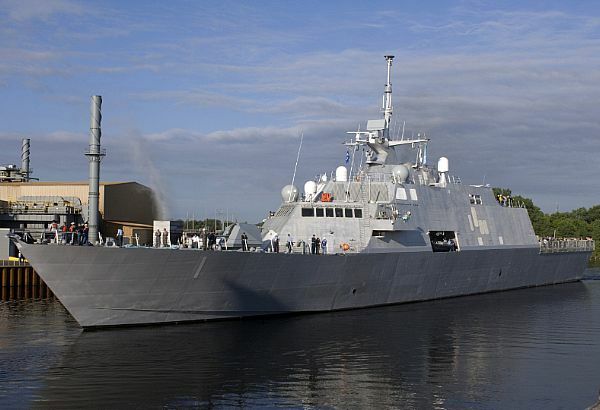 LCS-1 completed 2nd post commissioning refit. Begins firing exercises. 13Oct'09. Freedom (LCS 1) to be deployed in early 2010 for anti-pirate operations, two years ahead of her originally scheduled 2012 maiden deployment. 31Jan'10. Arrives Mayport, FL, to ready for Caribbean drug interdictions. 22Feb-11Mar'10 makes three drug captures on maiden deployment. April arrives San Diego. June'10 deploys in fleet programs. March'11 Continuous maintenance at San Diego. July - Sept'11 in yard to repair crack in hull. Jul'13. USS Freedom was forced back to its base in Singapore after diesel generators overheated while participating in international exercises ; replaced and returned to games. 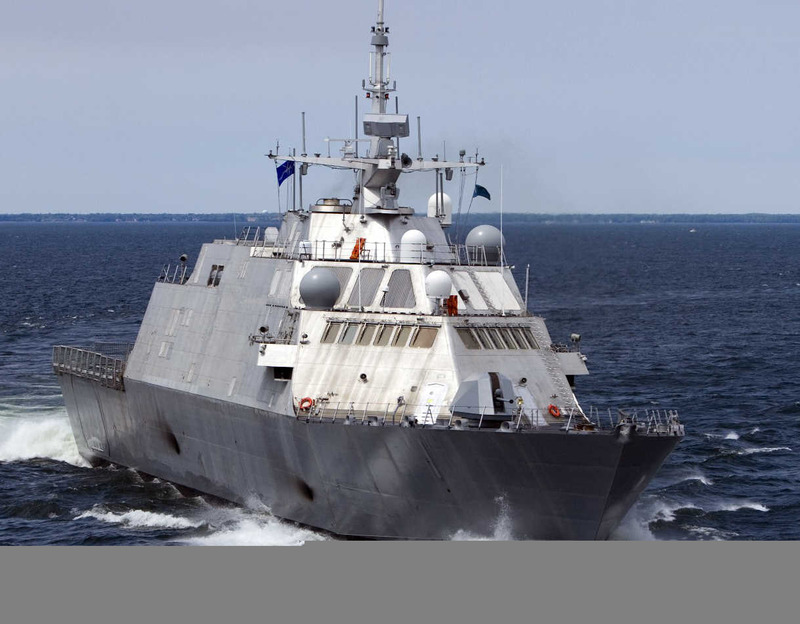 Independence (LCS-2) Designed by General Dynamics. Specifications: trimaran ; Displacement: 2176 tons (light), 2784 tons (full) ; Length: 416' (oa) ; Beam: 104' ; Draft: 13' ; Hull and superstructure: aluminum . Speed: 44 knots ; Range: 4,500 NM ; Core Crew 40 (8 officers, 32 enlisted) . Armament: 57mm gun, hellfire missiles and machine guns. 28April'08 launched. July'09, Builder's trials. Two years late and over budget by 300%, $220M went to $704M. Nov'09 Acceptance trials. Dec'09 Navy acceptance. Commissioned 16Jan'10. Sail away date 26Mar'10 to Norfolk for tests. 06May'10 New equipment fitting at Norfolk. Aug it fuels up. Then plan is to homeport San Diego. Video 2:15, Flash, high speed connection required. March'11 undergoing test and trials in Mayport, Fla. [pic] Apr'12 to San Diego. LCS Council of Admirals is established to assure LSC program is fixed. Feb 2013 Council issues plans and is to stay in existence. 13March'09 . LCS-3 Courage /Fort Worth and LCS-4 Coronado have been named with construction planned to start in the next year. Courage (LCS-3) Contract was awarded June 26, 2006 . 12Jan'07 construction was stopped at Lockheed Martin for cost over-runs on LCS-1. Resumed and stopped again (terminated) 13Apri'07. Intended to be faster and more maneuverable than the alternate design, we note the promised speed has been reduced from 59 knots to "over 40 knot". Lockheed Martin (LC-1 and -3) is the conventional hull design with high performance specification and should be the easier to estimate. The General Dynamics (LSC-2, -4) is radically new trimaran hull (narrow main hull with two smaller outboard hulls aft) has much larger helo deck space. 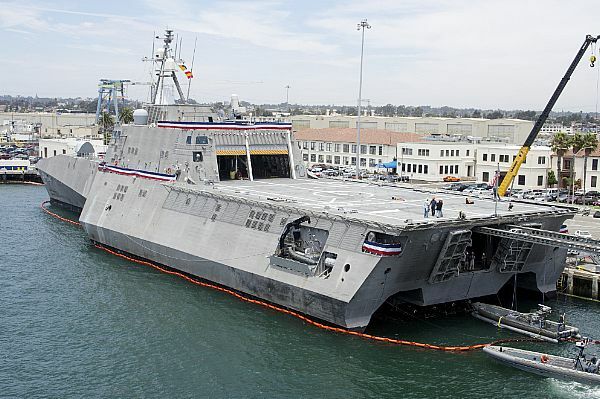 LCS-4 : The Navy is terminating construction of the fourth littoral combat ship following a series of cost overruns on LCS 2. Both designs have been criticized for giving up fuel / range for speed that will be little used, measured in hours. These boats should be of interest to USCG/homeland security for chasing drug runners. One study says seven LCS can perform anti-piracy patrols in the Western Indian Ocean replacing 20 conventional ships for a quarter of the cost. 18Sept'09. Comparison program canceled for economic reasons and a selection of one design will be made in Fy'2010 and that contractor awarded 10 ships for 2010-2014 and alternate vendors qualified. Target of 55 ships remains. In addition to new duties, the aging 25 Frigates (1979-89) , 14 Mine Sweepers (1987-1994), and 10 Patrol Craft (1993-95) must be considered, plus uncertainty of replacement of 22 Cruisers (1986-1994) and 60 Destroyers (1991-2011). 4Nov'10. Navy seeks Congressional approval of contracting for ten ships from each vendor for delivery of 20 ships in 2010 to 2015. Funding approved Mar'11. April'11. LSC-1 also had a waterjet replaced and welding failures repaired. April'11. Competition will award ten-ship block to one vendor and 5-ship block to the other. Later: Authorized ten of each design. USS Sumner (DD-692) 1944 Disp: 2,200 ; Len: 376 ; Speed: 34 kt ; 4 boilers, 2 st. turbines ; Comp: 345 ; 6- 5". USS Fletcher (DD-445) 1942 Disp: 2,100 ; Len: 376 ; Speed: 36 kt ; 4 boilers, 2 st. turbines ; Comp: 273 ; 5- 5". The current LCS type is not to be confused with LCS, Landing Craft Support, of late WW2. That LCS was 230 tons, 158-feet, armed with, 1- 3", 3 twin40mm guns with 130 built as a variation of the LCI, landing craft infantry.